Stormtroopers. Clone troopers. Snowtroopers. Star Wars has a lot of troopers, and that translates to an array of helmets. Todd Hoffman, an avid Star Wars fan and member of the Midwest Garrison of the 501st Legion, focuses on those helmets in his tattoo sleeve. He loves the original design of the stormtroopers in A New Hope and the idea of a sleeve focused on that helmet turned into an evolution and appreciation of all Imperial troopers. The tattoo was created over a span of six years from start to finish, with over 50 hours in the chair getting inked. It started with a tattoo of Luke Skywalker's lightsaber by Rich Kocis at Peace of Art Tattoo and then took on a new life with Imperial helmets. P. Krol of Krol Body Art in Chicago completed that portion of the tattoo. You can see Emperor Palpatine looming over a clone trooper, a scout trooper, an AT-AT driver, Boba Fett, and others in the tattoo. 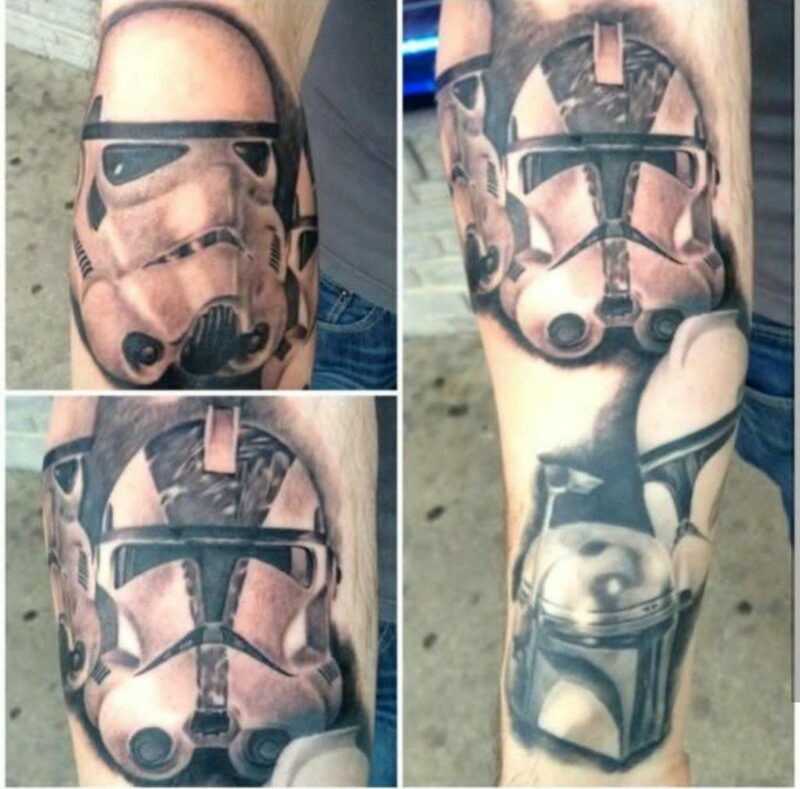 View more of the intimidating Star Wars trooper sleeve in the gallery below. If you have nerdy ink on your skin or you're a tattoo artist that applies pop culture, STEM, music, or other nerd-inspired ink (tl;dr: I want to see basically all of the tattoos -- not only Star Wars ones) on a regular basis, then please hit me up because I'd like to highlight you in a future Inked Wednesday gallery. I'm especially interested if you have a sleeve or other large tattoo. You can get in touch with me via email at [email protected] Send me photos of the tattoos you'd like me to feature (the higher resolution, the better) and don't forget to let me know the name of your tattoo artist if you have it, as well the name of the shop he or she works out of. If you are the tattoo artist, give me links to your portfolios and/or Instagram accounts so I can share them with our readers.